Fentie, Amare and Abebe Damte Beyene. 2018. 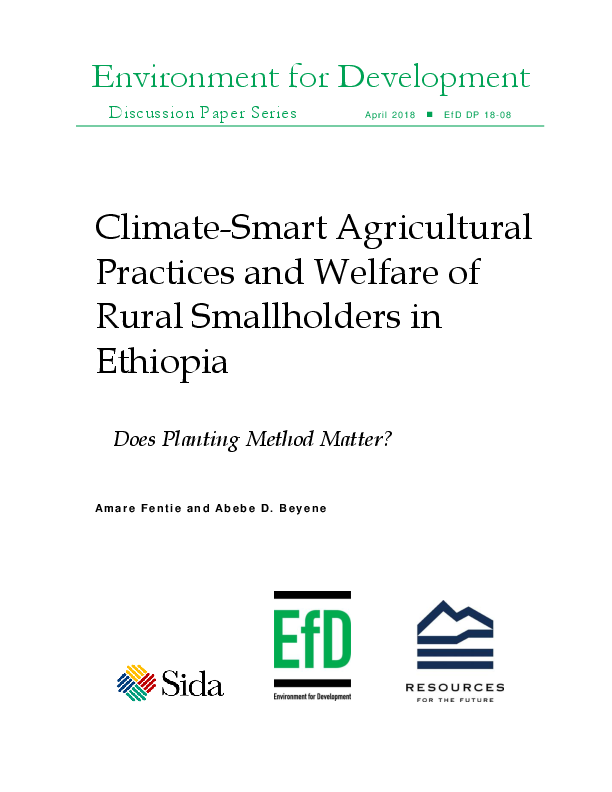 “Climate-Smart Agricultural Practices and Welfare of Rural Smallholders in Ethiopia: Does Planting Method Matter?.” EfD Discussion Paper 18-08. The purpose of this study is to provide empirical evidence on the impact of a climate-smart agricultural practice (row planting) on the welfare of rural households. Data collected from 260 households in the North Wollo Zone of Ethiopia were analyzed using Propensity Score Matching (PSM) and a semi-parametric Local Instrumental Variable (LIV) version of the generalized Roy model. The results from the PSM revealed that adoption of row planting technology has a positive and significant impact on per capita consumption and on crop income per hectare. Covariates are well balanced and the effect of unobserved selection bias on the impact estimate is insignificant, indicating that the estimates are largely the effect of row planting. Similarly, the semi-parametric LIV model suggests that average treatment effect is positive and significant for crop income. Marginal benefit of row planting is increasing with higher propensity of the farmer to adopt this practice. Therefore, scaling up the technology will significantly contribute to farmers’ resilience against the adverse effects of climate change through enhancing household’s income and food security.